A metal tower 300m high? In full Paris, city-light, magnified in the whole world for the beauty of its architecture? What a strange idea to want to uproot the capital of France by a huge unattractive, visionary, industrial pylon? This is, in the end, the opinion of many French artists who spoke from the beginning of the work. They were not necessarily wrong because if we put themselves in their places, what would we say today if an identical project came to light in the middle of Paris? No doubt the polemics would be, at least, as glaring as they were at the time. On the other hand, the way of expressing oneself between the end of the 19th century and our days would be very different. Here below reproduces the open letter addressed to Mr. Alphand, curator of the 1889 World Fair, by the artists against the Eiffel Tower. This letter was published in the newspaper "Le Temps" on February 14, 1887. It is signed by 47 people including Emile Zola, Alexandre Dumas son, Guy de Maupassant, etc. A more complete list is in foot of letter. Although this letter officially opened hostilities between the two parties, they did not end with the answers of the two people concerned. The artists wrote, during the following years, some poems and a little prose to prove that building this tower was a mistake. The second part of this page gives the text of these poems and explanations. We have come, writers, painters, sculptors, architects, passionate enthusiasts of the hitherto untouched beauty of Paris, to protest with all our strength, all our indignation, in the name of the unknown French taste, in the name of art and of French history threatened, against the erection, in the heart of our capital, of the useless and monstrous Eiffel Tower, which public malignity, often marked by common sense and the spirit of justice, has already named of "Tower of Babel". Without falling into the exaltation of chauvinism, we have the right to proclaim that Paris is the unrivaled city in the world. Above the streets, the widened boulevards, and the magnificent walks, rise the most noble monuments that the human race has produced. The soul of France, creator of masterpieces, shines amidst this august flowering of stones. Italy, Germany and Flanders, so justifiably proud of their artistic legacy, possess nothing comparable to ours, and from all corners of the universe Paris attracts curiosities and admiration. Are we going to let all this be profaned? Will the city of Paris go on to associate itself longer with the baroques, with the mercantile imaginations of a machine builder, to become irreparably ugly and dishonor itself? 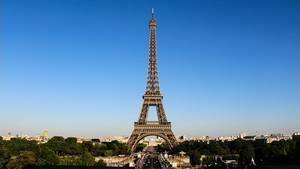 For the Eiffel Tower, which commercial America itself would not want, is, doubtless, the dishonor of Paris. Everyone feels it, everyone says it, everyone deeply grieves it, and we are only a weak echo of the universal opinion, so legitimately alarmed. Finally, when the foreigners come to visit our Exhibition, they will exclaim, astonished: "What? It is this horror that the French have found to give us an idea of ​​their taste so much vaunted? And they will be right to make fun of us, because the Paris of the sublime gothics, the Paris of Jean Goujon, Germain Pilon, Puget, Rude, Barye, etc., will have become the Paris of M. Eiffel. It's up to you, Monsieur and dear compatriot, to you who love Paris so much, who have embellished it so much, who have so often protected it against the administrative devastation and the vandalism of industrial enterprises, that it is the honor to defend it once more. We leave it to you to plead the cause of Paris, knowing that you will deploy all the energy, all the eloquence that must inspire an artist such as you love what is beautiful, what is great, what is right ... And if our cry of alarm is not heard, if our reasons are not listened to, if Paris is stubborn in the idea of ​​dishonoring Paris, we will have, at least, you and us, hear a protest that honors. This letter was signed on February 14, 1887 by 47 persons, including (in alphabetical order): Léon Bonnat, William Bouguereau, François Coppée, Daumais, Alexandre Dumas Jr., Gérôme, Charles Garnier, Charles Gounod, Eugène Guillaume, Joris Karl Huysmans, Leconte de Lisle, Guy de Maupassant, Ernest Meissonier, Edouard Pailleron, Victorien Sardou, Sully-Prudhomme, Joseph Vaudremer, Emile Zola, etc. Mr Alphand's answer is clear, it presents a lack of reception to the artists. Here is the text, with a slightly shorter explanation. Note that Gustave Eiffel has also responded to his critics, his letter is also published on this page. Messrs. Victorien Sardou, Alexandre Dumas, François Coppée and all of you who delivered this message with a strong resentment and a great fear of this monster of steel, do you consider that this giant metal would impose the dishonor of Paris in the eyes of the world? You speak to me of a "tower of Babel", but it is not a question of any monument destined to climb to the top of the skies, but of an architectural work intended to impose Paris in the eyes of France, if not in the eyes of the world. You tell me that commercial America did not want such a work? And although it is so, let fools get what they deserve: a desperately empty landscape of any object bringing a little bit of interest to their dismal country: let this sad country in the state where it is which implies a lack of originality and blatant modernity. This tower will certainly be "bolted" but learn, O you who read me, that any object described as solid contains metal, so learn that the wood burns and breaks, and that the stone crumbles over the ages, we build Gentlemen, the memory of this time given to the future generations, when your houses and your buildings will be destroyed by the irreducible race of time, will rise then this proud symbol which will demonstrate its solidity, and thus that of Paris, in the eyes of the universe. It is also to prove the greatness of France that we build this tower "vertiginously ridiculous" because who will dare to flout the honor of Paris, the city with the largest building ever built? Yes, certainly, I love Paris, I love its crowds, its markets, its monuments. I love everything in Paris and I would give everything for her, I certainly embellished Paris but this monumental work, with dantesque dimensions, will be the highlight of this universal exhibition, it will be my masterpiece. You describe my love of what is beautiful, what is great, what is right; but then, why these clamors? Why these screams? This passion? This work is created to demonstrate that there is no more beautiful city than Paris; by its size, this tower will make Paris sound as far as the East, through the icy steppes, the burning plains of the desert, through winds and tides, the whole world will hold its breath during the discovery of this gigantic tower; all will be amazed by the prowess of Paris. Finally, for the greater glory of Paris; and so from France, those who have the courage to dare to climb to the top of this titanic steel lady will discover a landscape like no other, they can then admire our sumptuous city in all its brilliance, discovering it with a point to another with its dazzling beauty that will always amaze the crowds. That's why, dear colleagues of the aestheticism, I strive to make succeed this project of titan which needs the efforts of all, but especially, of the agreement of all. Our gesture can not be criticized, but must be encouraged, our project must be placed in the admiration of all good French. We are building the new city of Paris. We build the Eiffel Tower. Gustave Eiffel's answer came in the form of an article published in "Le Monde", the same year. What are the reasons given by the artists to protest the erection of the tower? That she is useless and monstrous! We will talk about uselessness just now. For the moment we are dealing only with the aesthetic merit on which the artists are more particularly competent. I would like to know on what basis they base their judgment. Because, notice, sir, this tower, nobody saw it and no one, before it was built, could say what it will be. It is known until now only by a simple geometrical drawing; but, although it has been printed at hundreds of thousands of copies, is it possible to appreciate with skill the general artistic effect of a monument after a simple drawing, when this monument is so much of the dimensions already practiced and already known forms? And if the tower, when it is built, was regarded as a beautiful and interesting thing, would the artists not regret having left so quickly and so lightly in the country? So that they expect to have seen it to get a good idea and be able to judge. I will tell you all my thoughts and all my hopes. I believe, for my part, that the tower will have its own beauty. Because we are engineers, do we believe that beauty does not concern us in our constructions and that at the same time that we make solid and durable we do not strive to make elegant? Do not the true conditions of force always conform to the secret conditions of harmony? The first principle of architectural aesthetics is that the essential lines of a monument are determined by perfect appropriation to its destination. Now, what condition have I had, above all, to take into account in the tower? Wind resistance. Well ! I claim that the curves of the four edges of the monument, as calculated, have provided them, which, starting from a huge and unusual wheelbase at the base, tapering to the top, will give a great impression of strength and beauty; for they will translate to the eyes the boldness of the design as a whole, just as the many voids in the very elements of the construction will strongly accuse the constant concern not to deliver unnecessarily to the hurricane violence surfaces dangerous for the stability of the planet. 'building. The tower will be the tallest building that men have ever built. Will it not be so grandiose in its own way? And why would that which is admirable in Egypt become hideous and ridiculous in Paris? I search and I admit that I can not find. The protest says that the tower will crush with its big barbaric mass Our Lady, the Sainte-Chapelle, the tower Saint-Jacques, the Louvre, the dome of the Invalides, the Arc de Triomphe, all our monuments. How many things at once! It makes you smile, really. When we want to admire Notre Dame, we will see it from the forecourt. In what way will the Tower of the Champ-de-Mars hinder the curious placed on the parvis Notre-Dame, who will not see it? It is, moreover, one of the most erroneous ideas, though more widespread, even among artists, than that consisting in believing that an elevated edifice crushes the surrounding buildings. See if the Opera does not seem more crushed by the houses of the neighborhood than it crushes them itself. Go to the roundabout of the Star, and because the Arc de Triomphe is large, the houses of the place will not seem smaller. On the contrary, the houses seem to have the height they really have, that is to say about fifteen meters, and it takes effort of the mind to convince themselves that the Arc in triumph forty-five, that is, three times more. There remains the question of utility. Here, since we leave the artistic domain, I will be allowed to oppose to the opinion of artists that of the public. I do not think I am vain in saying that no project has ever been more popular; I have every day proof that there are no people in Paris, however humble they may be, who do not know him and are not interested in them. Even abroad, when I happen to travel, I am surprised at the repercussions he has had. As for the scientists, the true judges of the question of utility, I can say that they are unanimous. Not only does the tower promise interesting observations for astronomy, meteorology and physics, not only will it allow wartime to keep Paris constantly connected to the rest of France, but it will at the same time be a striking proof of progress. made in this century by the art of engineers. It is only in our time, in recent years, that one could make calculations that are fairly reliable and work with precision enough to think of such a gigantic enterprise. Is it nothing to the glory of Paris that this summary of contemporary science is erected in its walls? The protest gratifies the tower of "odious column of bolted sheet". I did not see this tone of disdain without being irritated. There are men among the signatories whom I admire and esteem. There are others who are known for painting pretty little women putting on a flower in their bodice or having turned spiritually some vaudeville couplets. 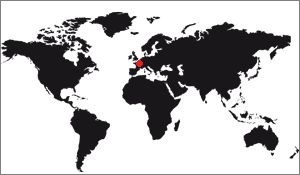 Well, frankly, I think that all France is not in there. M. de Voguë, in a recent article in the Revue des Deux Mondes, after having found that in any European city where he passed he heard Ugene singing, you make me feel sorry for me and the Bi at the end of the bench wondered if we were becoming the "græculi" of the contemporary world. It seems to me that it would have no other reason to be than to show that we are not only the country of amusements but also that of the engineers and builders we call from all parts of the world to build up bridges, viaducts, railway stations and the great monuments of modern industry, the Eiffel Tower deserves to be treated with more consideration. What does the protest letter tell us? By the way it has been broadcast, through the newspaper "Le Temps", it wants to be addressed to a wide audience. 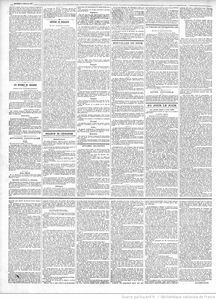 "Le Temps", was a French newspaper published daily in Paris between April 25, 1861 and November 29, 1942. Initially objective, according to the testimonies of the time, it turned towards the center left from 1873, when the title is ceded to Hébrard. He was a little more focused on international news than the others, his scope was wider than the others, he had a serious image and represented rather well engaged artists. 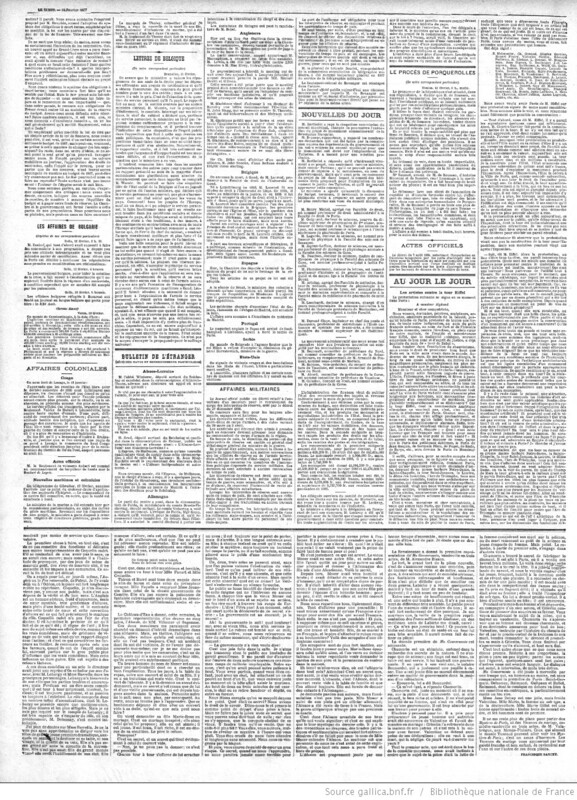 Le Temps newspaper of February 14, 1887, publishing the protest letter of the artists. Then we see that the letter begins with a protest. From a finding would have been more unifying, it would have found a fact and issued opinions on this subject. On the contrary, the authors preferred to immediately mention their grieffes, and rather vehemently, in the bombastic style of the time. Nevertheless, they go straight to the point, clearly explaining that Paris will be distorted by this gigantic metal structure. To support their remarks they highlight the beauty of Paris, in particular the monuments that the history bequeathed to the city. And they do not hesitate to amalgamate between the beauty of Paris and the soul of France, to also increase the scope of their remarks. This is confirmed by the last sentence of the first paragraph, when they speak of the different countries which, supposedly, do not possess the wonders of Paris. The second and third paragraphs put forward the ugliness of the tower. Gustave Eiffel is considered a machine builder who wants to industrialize the Parisian landscape. They are witnessing the future visitors to the World Expo, mainly foreigners, who would come to see the ugliness of the capital and draw adverse conclusions about the country, at a time when nationalism was a feeling shared by all peoples European. Others, this tower was involved in the decline of the French aura in the World, by its mere presence at the World Expo. The assembled artists then leave in their letters on the same subject initially, with the same argument, the ugliness of Paris, but this time they quote famous monuments like Notre-Dame, the triumphal arch or the dome of the Invalides. This enumeration gives more force to their comments, allowing readers to feel closer to their points of view by making the construction of the Eiffel Tower worrying. The letter ends with the direct interpellation of Mr Alphand, curator of the 1889 World's Fair. The authors put him before his responsibilities to the appellant to plead the Paris cause, to the detriment of that of Gustave Eiffel . Did they believe in their causes? One can doubt this because the last sentence of this letter gives pride of place to the possible failure of their demands "we will have, at least, you and us, made hear a protest that honors". Was this letter likely to ban the construction of the Eiffel Tower? We will never really know it, but no doubt the answer is no, because it came when the tower was already starting to come out of the ground, it was the result of an architectural competition and that the choice of building it had been made a few months ago. It was therefore hard to see how French artists, however well known, could have tipped the scales in their favors so late. The responses of Eiffel and Alphand to the attacks of the artists are very different. That of the curator of the world exhibition is shorter, less incisive. He takes an argument and turns it in favor of the tower, it is the argument of the denaturation of Paris. If the artists think that the tower will spoil the Parisian landscape, he sees on the contrary a source of pride for the capital to possess the highest construction of the World. He takes the opportunity to criticize Americans clumsily that have nothing to do with this conflict, and ends up using this argument by pointing out that other building materials are more fragile or unsuitable, iron being neither more plum nor less interesting than another. The letter ends with the pride that each French must feel at the idea of ​​having this tower on his floor: Mr Alphand thus makes the patriotic rope vibrate, very used at the end of the 19th century. The first principle of architectural aesthetics is that the essential lines of a monument are determined by perfect appropriation to its destination. Now, what condition have I had, above all, to take into account in the tower? Wind resistance. If the aesthetics of a monument is really linked to its destination, in the sense that it means it, Paris could indeed be disfigured, especially since it gives the artists the right to be judges of the aesthetic, which seems normal. More logically he sweeps the argument that the Eiffel Tower will crush other Parisian monuments. It is clear that he is right to reject the argument, more than a century later, it is still not the case for it will never be, the tower is an element of the heritage of the city, it is not do not eclipse others. Finally there are two arguments, which appear at the end of the list. The first is probably the most interesting because it highlights the scientific interest of the tower, which will prove true thereafter. Eiffel already imagined the technical applications he could make of such a monument. But in writing that, he forgot the main thing: His detractors did not (mainly) accuse him of the uselessness of the tower, but of its unsightliness. This argument, if it has its interest, is not the main thing to put forward. The last argument refers the artists to their responsibilities, namely the amusement of the public or the highlighting of French culture, while stating that France is not only made of artistic works but also of engineers, and that all professions must be put forward to increase the power of France in the world. Thus ends the contest which was engaged, briefly, between a collective of 47 artists, some of whom enjoyed a great reputation, the builders of the Eiffel Tower, in 1887. But if the battle was won by the builders, the Artists then fought with their own weapons: Artistic works. Thus poems were written to highlight the ugliness of Paris due to the mere presence of the tower. The most famous is probably that of François Copée, written in 1889, who called an answer from Raoul Bonnery, in the same form. The two artists published in different newspapers poems rather claims. Et du lointain... encor, encor ! Ô Moyen Age ! ô Renaissance ! Ô bons artisans du passé ! Ô vieux siècles d’art, quelle honte ! What strength in this poem! It begins with a few quatrains on the ugliness of the Eiffel Tower, using selected words. It continues with the description of the view from its top, and according to the author it must be admitted that Paris seen from above is hardly interesting: The obelisk is seen as a simple needle, the whole town planning is compared to a relief map, etc. The third argument is murderous for the tower. It is considered as a simple source of income for the authors, begging at all costs of money to go up there, to restore there, or by asking for a tip. Finally the fourth argument, which is also the last, is the most important, especially for the time. It highlights the waste of metals for this construction at a time when wars are close. However, a war requires a lot of metals, behind this argument there is implicitly an accusation by the author that the builders risk provoking the capitulation of France, nothing less, in case of conflict. As can be imagined the patriotic feeling being particularly strong at the end of the nineteenth century, the argument is supposed to fly. It is also funny to note that a few years later, the tower will be saved by the army precisely, who was able to make the first tests of wireless transmission. She had then acquired a certain interest for the military. The answer to this poem by François Copee arrived in May 1889 by Raoul Bonnery, defender of the tower and disciple of Sully-Prudhomme and member of the Society of the People of Letters. He. He made another poem of his composition appear in "Le franc Journal", adding a stone to the war that was engaged defenders and detractors of the Eiffel Tower. Des hauts monuments de la terre. C'est fait, j'ai tenu mon serment. Pour arme, une plume à la main. Que tu comptais vaincre, vraiment ! Entendre me crier : Haro ! Tu m'eusses mordu … de tes vers ! Du fer, je suis l'apothéose ? Je lui bâtis un piédestal ? N'est point si vulgaire métal. Le fer aura toujours le prix. Parler de progrès jusqu'aux cieux. Un jour, flottera radieux ! Phare : voilà ma mission ! This poem is a perfect answer to the previous one. It is made on the basis of quatrains that take up the accusation of François Copee, in a rather solemn way besides, without really attacking it ... at least until the murderer verse "Do you believe that such molosse, you m would have bitten ... of your verses! " Note that the two verses "On my cold heights if no one comes to hear me, I breathe at ease and do not want to go down" are from Laprade, it is a voluntary loan of the author's share. In the rest of the poem he oscillates between dismantling the arguments mentioned, such as the use of iron, and the mocking of the attack. Finally, if the form is poetic, the background is quite simple, the message is clear: No, the tower is not unsightly, it has improved the stature of France. In 1890 Guy de Maupassant was one of the members who signed the open letter to Mr Alphand, curator of the 1889 World's Fair, a letter in which 47 artists openly criticized the erection of the tower. So it is logical and normal that we find this rejection of the Eiffel Tower in his work. This is the case in one of these writings of 1890, "The Wandering Life". This is even the beginning of the book. I left Paris and even France, because the Eiffel Tower ended up boring me too much. Not only was it seen everywhere, but it was everywhere, made of all known materials, exposed to all windows, inevitable nightmare and torturing. Not only that, she gave me an irresistible desire to live alone for a while, but all that was done around her, in, on, around. How did all the newspapers really dare to speak to us of new architecture about this metal carcass, because architecture, the most misunderstood and the most forgotten of the arts today, is perhaps also the most aesthetic, the most mysterious and the most nourished of ideas? He has had this privilege through the centuries to symbolize, so to speak, every epoch, to summarize, by a very small number of typical monuments, the way of thinking, feeling and dreaming of a race and a civilization. Some temples and some churches, some palaces and some castles contain almost all the history of art throughout the world, express to our eyes better than books, by the harmony of the lines and the charm of the ornamentation , all the grace and grandeur of an era. But I wonder what we will conclude of our generation if some next riot does not debouch this high and thin pyramid of scales of iron, disgraceful skeleton and giant, whose base seems made to carry a formidable monument of Cyclops and abort in a ridiculous and slim factory chimney profile. I do not care, by the way, the Eiffel Tower. It was only the lighthouse of an international fair, according to the consecrated expression, whose memory will haunt me like the nightmare, like the realized vision of the horrible sight that can give to a man disgusted the human crowd who is having fun. I will refrain from criticizing this colossal political enterprise, the World Expo, which showed the world, just when it was necessary, the strength, vitality, activity and inexhaustible wealth of this country surprising: France. Probably to give more force to his story Guy de Maupassant treats him in the first person. He sets up a character who is tired of seeing the Eiffel Tower everywhere, in real life or not, and who is wondering what interest is there to devote his own interest to it. The text gives more the impression of a disgust than a revolt, the opposition of the author towards the tower is exceeded. There is already acceptance, faced with this monument deemed useless.